Statue to commemorate the launch of Lenovo’s new Android tablets in Kenya, Nigeria and South Africa. PC Supplier, Lenovo has announced plans to create a uniquely African Android statue. This landmark campaign is to commemorate the launch of the Lenovo A1000, A3000 and S6000 Android tablets in Africa. The most famous Android statues have been created by Google and are located at their corporate headquarters (Googleplex) in Mountain View, California. These statues document important milestones in the history of Android and have traditionally been based on the code names for the versions of Google's Android mobile operating system, which are named alphabetically after desserts: Cupcake, Éclair, Frodo, Gingerbread, Honeycomb, Ice Cream Sandwich, Jellybean. It has been rumoured that the next official version of Android will be called Key Lime Pie, a traditional American dessert – but Lenovo has decided to launch a campaign to ask Africans what they would name it if they had a choice. Lenovo will then build a statue, modelling it after the winning name. The campaign is accompanied by a social media competition on Lenovo Africa Facebook page (www.facebook.com/LenovoAfrica) asking Android and Lenovo fans, in South Africa, Nigeria and Kenya, to name the statue. The winner of the best and most creative name will receive a hamper full of Lenovo goodies worth USD 2,000. The winner will be chosen by Lenovo and the Africa Android statue will be unveiled in October this year. Lenovo’s new Android tablet range starts with two new A-series 7” tablets designed for optimal mobility while still packing a performance punch. The A1000, with Dolby® Digital Plus, will deliver a dazzling experience for music and entertainment lover, while the A3000, with its ultra-responsive quad-core processor, is high-performance tablet that’s portable enough to slip in your jacket pocket. .
Alongside these models, Lenovo also launched the new and stylish S6000. The slim, light and comfortable to hold tablet is powered by a quad-core processor and delivers the performance users need to enjoy the latest apps and games on Android 4.2 Jelly Bean, while its 10.1" HD IPS mutitouch display guarantees a bright and vivid viewing experience. Mobile Service Provider Bharti Airtel (“Airtel”), and Nokia are targeting the socially active youth market in the region with the introduction of free access to Facebook on Asha 501. Internet access continues to grow in East Africa, driven primarily by high mobile phone usage and stiff competition among the service providers. The growth in mobile data consumption can largely be attributed to the popularity of social media. This craze, particularly amongst the youth market, is encouraging companies to enter strategic partnerships to offer attractive packages and incentives to consumers as they strive to stay ahead of the game. According to the Communications Commission of Kenya (CCK), there are over 9.49 million Internet subscribers in Kenya alone. Mobile access continues to dominate, representing 99 percent of the total subscriptions. In the first quarter of this year, the estimated number of Internet users rose by 11.6 percent to reach 16.2million, from 14.5million users in the previous quarter. This increase is attributed to the growing demand for Internet and data services, including the use of social media, especially amongst the youth. Competitive tariffs by the mobile operators are also contributing to the growth. Based on these market dynamics, the two companies are banking on the combination of colourful, affordable and fun smartphones with free access to Facebook to appeal to the vibrant youth market. These consumers are already active on social media, especially Facebook, which continues to be the most popular social media channel in Kenya. It’s estimated that Facebook in Kenya has over 2.2million users, while Twitter has only around 500,000 users. 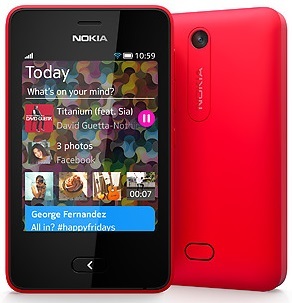 The Nokia Asha 501 is available in a choice of striking colours. Its seamless design comes in just two parts: a durable, removable “shell” and the scratch-resistant, tempered glass display. The compact, easy-to-use Nokia Asha 501 weighs only 98 grams, for the ultimate in portability. Sony, the leading consumer electronics brand, today announced the launch of the Shake-7, the new super high power Home Audio System with massive 31,350W PMPO power output. Designed for the true music lover who craves for high powered audio and heavy bass, the Shake -7 is an ideal product for the Kenyan market. Chief Representative, Sony Middle East and Africa, Kenya office, Rajeev Pallippamadam said that the launch of Shake-7is part of the company’s commitment towards cementing its position as the leading global consumer electronics and entertainment brand in Kenya. “The Shake-7 is by far the most powerful home audio system ever made. As a company, we would like to prove our commitment to our Kenyan customers by providing home owners with an authentic high power system that delivers high quality and powerful sound distinctly better that any other home audio system available in the market today,” added Pallippamadam. The system’s four-way speaker delivers clear vocals and more balanced sound. It offers the latest One Touch Listening and Wireless Music Playback from mobile phones, tablets, laptops and various other NFC and Bluetooth enabled devices. Along with the wireless playback, SHAKE-7 also features traditional playback options such as CD, Dual USB input, Radio, Auxiliary Audio input and Microphone input. The Dual USB input on a well-lit main unit not only allows mp3 playback and but also allows you to copy songs quickly from all sources to a USB storage device in mp3 format. This high power system delivers high quality powerful sound distinctly better than any other home audio system available in the market today. With built-in DJ Music and Light features, whether a formal event or a big house party, the system never fail to impress your family and friends. The SHAKE 7 is currently available at all Anisuma Traders outlets and certified Sony dealers countrywide. LinkedIn is a vital tool for millions of professionals across the globe. The world’s largest professional network on the Internet offers easy ways to connect with old and new business contacts, keep up to date with trends in your industry, research and prepare for meetings and expand your professional network. LinkedIn is now available as an app for the full-touch range of Nokia Asha devices*, including the new Nokia Asha 501, making it even easier to stay in touch with colleagues. Nokia today announced that the Nokia Asha 501, the first of a new generation of smartphones to run on the new Asha Platform, is available for purchase across East Africa. The Nokia Asha 501 features distinctively Nokia design, a faster and more intuitive user interface and smarter Internet experiences – all at an affordable price. Nairobi Bottlers Limited, Coca-Cola’s leading local independent bottling franchise, has invested Shs1.2billion in a new preform manufacturing plant as the demand for plastic bottled products increases. The new state of the art facility will enable the company to produce preforms used in the manufacture of plastic bottles for packaging of Coca-Cola range of soft drinks and Dasani water. Previously, Nairobi Bottlers has been sourcing these raw materials from independent suppliers in the country. The huge investment is part of Nairobi Bottlers’ growth strategy as it strives to take advantage of emerging opportunities both locally and in the export markets within the region. The new facility takes the total investment by the company alone to over Shs3billlion within a year. Nokia and Microsoft have announced the availability of a new range of Islamic and Ramadan apps on the Windows 8 platform. The new range of Islam and Ramadan relevant applications can now be downloaded directly from the Windows Phone Store on the Nokia Lumia range of smartphones and includes feature packed Ramadan Kareem, Quran Mojawed, Muslim Prayers and Essential Duas. According to Nokia’s head of developer engagement, innovation and corporate relations East Africa, Moses Sitati, there has been an increase in the number of apps being developed specifically on religion. This trend is reflecting in both the Nokia Store and Windows Store.